Being an IT strategy person in a large company today is a frightening experience. The world is changing so fast that trying to change business, technology and culture all at the same time seems nearly an impossible task. Digital transformation is crashing into the enterprise like giant sea waves. The impact is affecting: communication, business, commerce, supply chains, products, marketing, maps, sales, retail, media and entertainment, R and D, customer interactions and engagements and social collaboration, etc. Digital transformation is real and companies that don't fully understand the impact in their industries and markets are at risk. It is our purpose here to share what we are seeing in the market, so you can be aware and prepared to respond in the appropriate time. 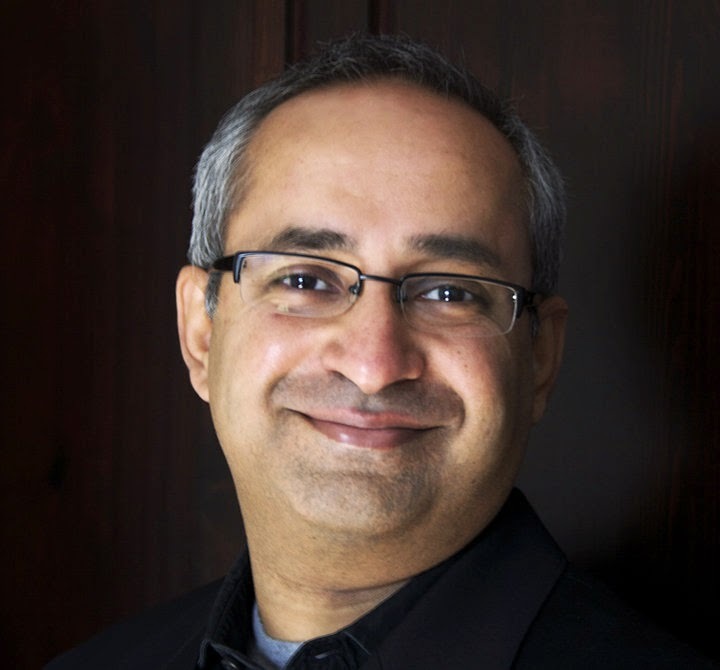 In this article, my colleague, Ved Sen, who is the Global Head, Advisory Services, Social, Mobile, Sensors, here at Cognizant, shares his insights on enterprise social collaboration. The old models of email driven communications simply are not the most effective across large enterprises. Please forgive his Englishness. Enjoy! If you’re reading this in the last months of 2014, it is likely that you belong to a company which has pondered enterprise-social platforms. And it’s likely that many head scratching moments have occurred and that the answers so far fall into broadly two camps. External use and mining of social media is now well understood as a means to build customer engagement and feedback. Plenty of people still get this wrong but tools like Clarabridge are strong players in this area. The more perplexing piece is the use of social platforms inside the business and here, most businesses have explored rolling out Yammer or Chatter and are often wondering ‘what next’? Many are actually struggling to justify what it is that they are getting out of this? In the rest of this piece, I’d like to suggest that the Enterprise Social Platform is an idea whose time has come and that in 2015 we will all be flipping to the new model of enterprise social. Information-flows in big companies typically represent hierarchies. So information typically flows much more smoothly up and down hierarchies and quite poorly across these lines. This is just a truism of corporate cultures and represents a significant inefficiency. Second, reward systems in most companies are typically not aligned to avowed corporate values. Many companies try to enshrine values such as collaboration into their work culture but have no means in place to recognise or reward such behaviour. Consequently, collaboration, or other such values, are often a road-kill in the stampede of those behaviours which are actually rewarded – often to do with sales targets and hard numbers. This is arguably detrimental to the business in the longer run, and this is specifically the problem that WorkAngel, one of the startups in this space is seeking to solve. And how exactly do we measure the internal transaction costs of doing business? For example to create a proposal or to deliver a project, you might need to work with up to a dozen people from different teams and departments. Often the two kinds of transaction costs you encounter are (a) time to locate the right person and (b) the time and effort-cost of the transaction, given that the said person may have no idea about who you are and may have no motivation to support you. Again, start-ups such as ProFinda and WorkAngel look to solve these everyday problems. Another challenge you face as you grow larger and more global, is the tendency of localised problem solving. Would you even know if the problem you’re trying to solve (say, a branch specific problem in a Bank or a retail outlet), has been solved somewhere else in the organisation? Or that the expertise exists elsewhere? Also known as the re-inventing the wheel syndrome. Many people have written in recent times about the role of culture – often more important than strategy as a critical contributor to success of an organisation. Where does your culture reside? Where is it rooted? How do you create a crucible for capturing this? Even more so when you go through mergers or acquisitions and you are trying to quickly forge a new culture, and all the earlier challenges reappear in starker ways. And what about all the soft information that you increasingly need to hold and manage but have no repository of? Somebody in the team worked as a volunteer at a hospital and has the insight which could make a big difference to your healthcare project. But it’s not in her CV, or in your corporate systems. And all the conversations between people that hold ideas and sparks for new products. And that brainstorming session that could have been a product, but everybody got busy with a bunch of other projects? Where is all of that intellectual capital? And a last but important challenge: we are today in the world of bring your own self. This is a term I first heard used by Ade McCormack while we were discussing BYOD. But the idea is ubiquitous – increasingly we are blurring, in positive ways, the line between personal and professional. We no longer have to leave our personalities and hobbies at home because increasingly those can represent pools of capabilities or knowledge that can add value to our work and to our businesses. We are being encouraged to bring our whole selves to work. And our information systems are inadequate to reflect and represent our whole selves. We know that we’re moving from systems of record to systems of engagement in most businesses. Implicit in this is a move from structured to unstructured information. And from data and transaction centric to relationship and conversation centric information. It also implies the move from desktop to mobile and from process based to context based information. John McCarthy and his colleagues at Forrester have a report on this. Seen in this context the enterprise social platform is that new and complementary layer which holds this new conversation centric, context based, relation and human oriented information which seeks to address the problems we outlined earlier. There are two key words here. (a) Complementary – nobody is suggesting we junk our transactional and structured data in favour of the warm and fuzzy. and (b) seeks – there is no guarantee. A lot will still depend on that pesky notion of implementation. Social platforms are inherently non-hierarchical. Although there are some like Loyakk, which are designed around certain types of hierarchies, most are designed to engineer those serendipitous or interest based discussions, or perhaps around specific problem domains which are independent of hierarchy. On a social platform it’s not just the HIPPO who get’s his/her way. (Highest Paid Person in the Organisation). So cross hierarchical and also cross departmental conversations become quite common on social platforms. I have found Yammer perfectly good for this kind of discussion. For example when I wanted to know how to create an internal enterprise blog, I had 3 good answers in about 30 mins of posting a 1 line question. I’m excited talking to next generations social platforms, such as ProFinda and WorkAngel because they go to the core of the social challenge outlined above. WorkAngel, for example has a mechanism for explicitly identifying and rewarding those behaviours which align with the avowed organisational values, through a social feedback mechanism. What’s more the rewards can be quick and even financial. ProFinda’s secret sauce is the algorithm that goes to work on all your data both structured and unstructured, internal and external, to create relationship patterns which tradition tools don’t or can’t get. Both of these are softwares you license and install, so we mustn’t confuse Social Technologies with Social Media. Both of these have strong mobile platforms and analytics, so critical to today’s needs. As does Broadvision, with it’s Vmoso mobile solution which sits on top of the Clearvale social platform. It’s always useful to have clear and measurable business objectives. 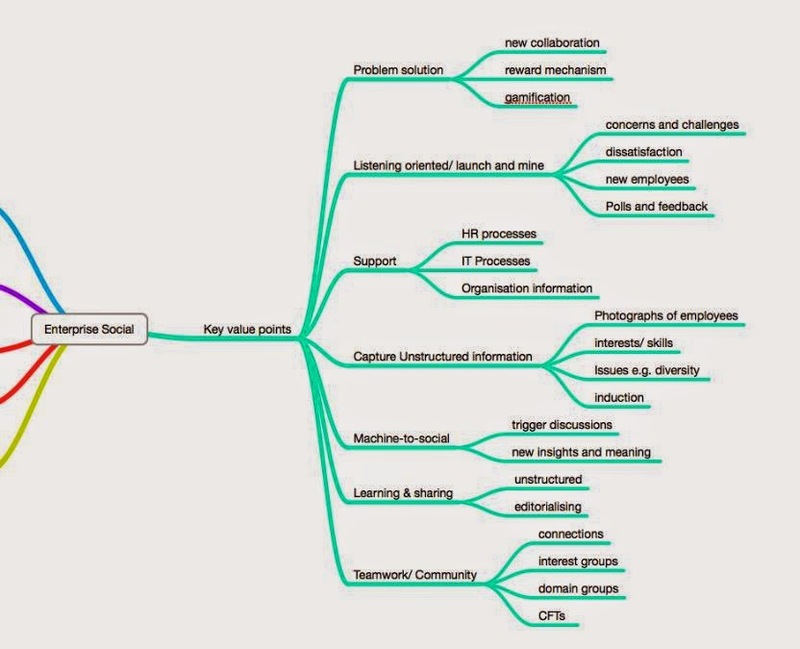 Following a discussion with one of our clients who wanted to implement a well known social tool, but didn’t have a clear business case, we drew up this mind map. The idea was simply to identify the different types of problems that could be solved by the tool in question, from providing support on HR issues or driving cross functional teams. I would urge taking this further till you can see a clear path to money – either money earned or saved. You may not get clear answers but it will still provide clarity of thinking and enable you to get the right data going forward. ”, call ‘provide and pray’. Don’t just invest in the platform and hope some good will come of it. But Can’t We Experiment With New Models? Does this sound contradictory with the notion that with new technologies, you don’t always have a clear business case, and you need to try stuff? The key here, I believe, is that if you’re trying it out, it should be (a) a controlled experiment and (b) with specific learning objectives. So the learning becomes the business objective and backed by an understanding of the metrics of that learning. (3) Avoid buzzwords like ‘gamification’ if they are not delivering your business objective. Can social experiences truly be engineered? Probably not a hundred percent. But they can be curated. And the right platform, with the right implementation underpinned by clarity of goals, will go a long way in getting you there. Can true collaborations across hierarchies actually take place in large companies? Probably less so in high power-distance cultures. How you enable the voice of the junior most people in the business is definitely a part of the answer. What about the work/ non-work balance? This goes back to the point earlier about bring your own self. This is going to be one of the key debates as we move away from traditional office environments with clear time and place separation of work and personal. New mores and guidelines will evolve. It is entirely possible that people in err in both directions. This space needs watching and again, it won’t harm to gather data which can help to create those guiding principles. Unless there is a specific need for point to point communications between people who need it, the publish subscribe model is a far more efficient way of communicating. Facebook has made us comfortable with the notion of a feed and thanks to social media platforms, we are all able to post, follow, engage and respond as we feel best. No education is required here. If done right, the social layer will be the neural network of your enterprise. Not getting it right, though, will lock your business into the past and history is very unkind to anybody who doesn’t evolve.